The popular monotheistic religions have an established history of violent outbursts in response to perceived transgressions. One faith in particular stands out at this moment in time for its refusal to join the enlightenment. Some may recall the reports of Qur’ans being desecrated by U.S guards at Guantanamo in 2005. This sparked deadly riots throughout the Muslim world. 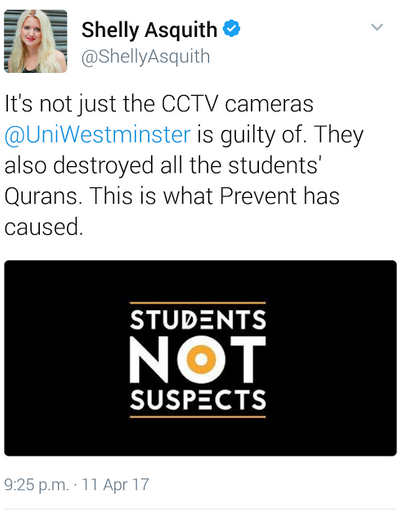 Here, a Vice President of the National Union of Students is going on record with the claim that The University Of Westminster, London has ‘destroyed all the students’ Qurans’. 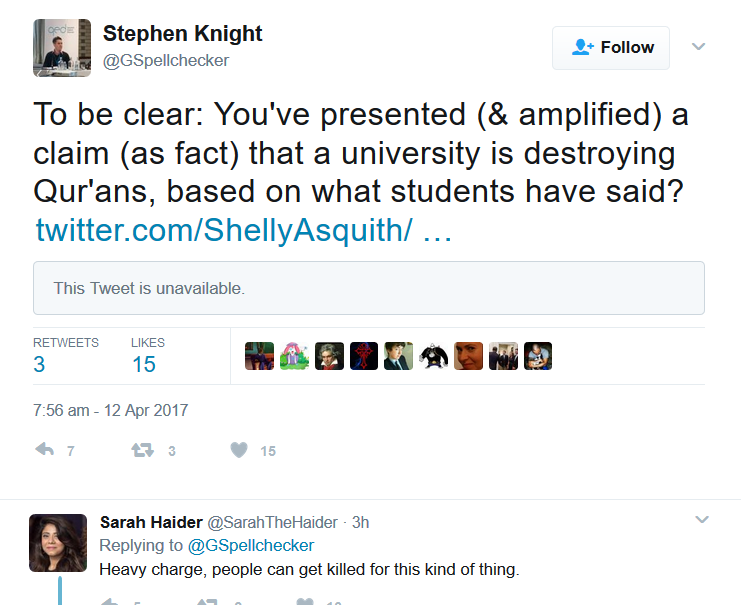 And not only has the University engaged in this act of ‘desecration’, but they are doing so because of Prevent, the UK Government’s anti-extremism strategy. In other words, it’s an anti-Muslim act. “Heavy charge, people can get killed for this kind of thing” warns Sarah Haider, Co-Founder of Ex-Muslims of North America. The on-going Islamist/left-wing anti-prevent love affair continues to blossom. Naturally, this caused a flurry of Twitter attention in response. 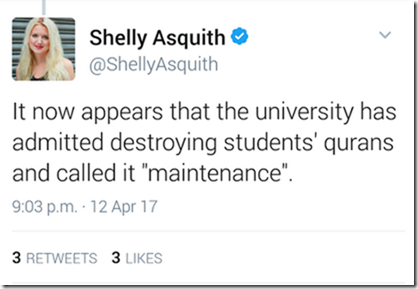 Asquith has since protected her Twitter account. 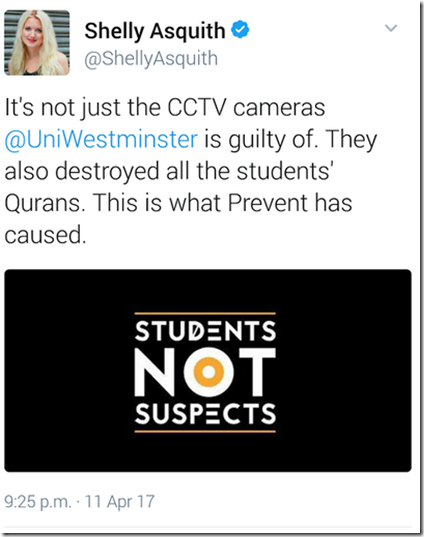 I’ve no reason to doubt Asquith was told this by a number of students, but keen to learn the facts for myself and ‘prevent’ this from getting out of hand, I contacted the University of Westminster directly. 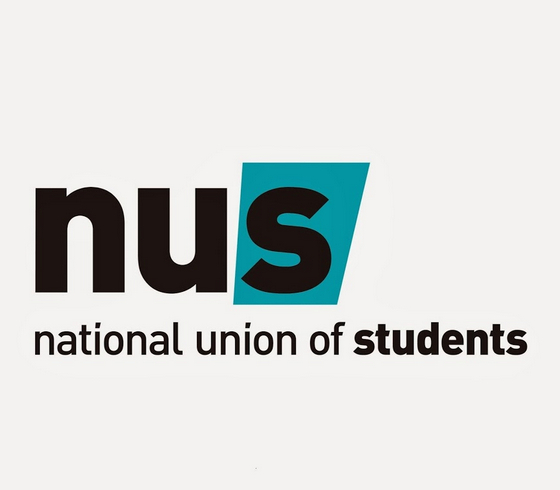 A Spokesperson from the University told me that in 2016 it was decided that a prayer room at the University would be turned into a multi-faith room. The consultation/transition period for this change began in the summer and ended in December 2016. During this period, the Islamic Society (ISOC) were consulted and made aware that any existing materials would need to be removed from the room, otherwise they would be disposed of on a forewarned date. And that is exactly what happened. This wasn’t an act of desecration, it was planned maintenance. And maintenance that was carried out with due consideration to, and consultation with, the interested parties. There you have it. Nothing to do with Prevent, nothing to do with anti-Muslim sentiment. A something over nothing. 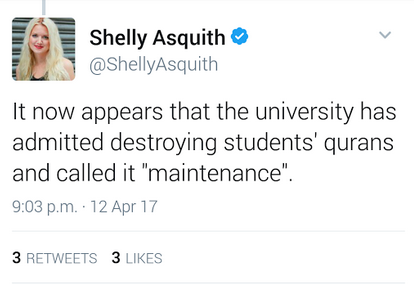 I had hoped Shelly Asquith would read the above, quietly reflect and then retract her claims. 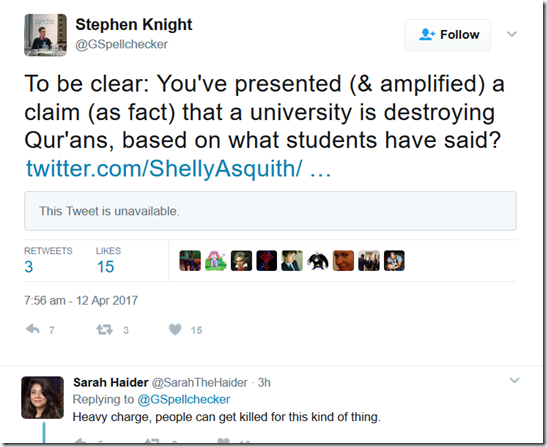 Unfortunately, she has decided – fully aware of the dangers – to double down and further endanger lives with her misinformation. 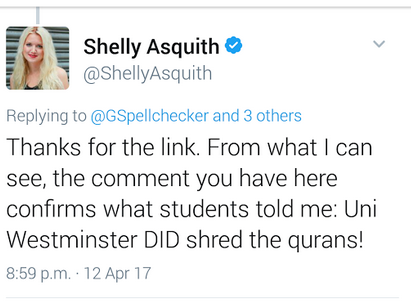 I’d hoped for a different outcome, but it seems Shelly Asquith is unspeakably irresponsible and is committed to stoking religious tensions. Ah. 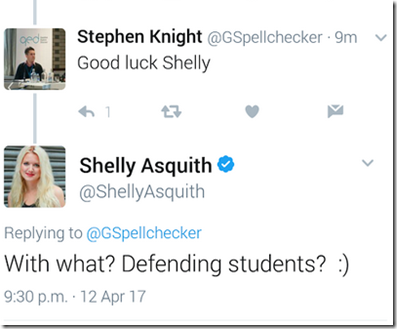 Shelly Asquith, a name very familiar to progressives and liberal campaigners. She has long being a regressive who is hostile to liberal values, Ex-Muslims, freedom of expression, and in particular, the Prevent strategy, etc. Every single time, she has doubled-down or wiggled around when confronted with evidence and facts. If this claim has no basis, it is extremely irresponsible of her to spread this rumour. I’m sure she is very critical of those on the right who spread “fake news”. I am open, as I’m sure Stephen is, to the fact this might have happened. Whether it was deliberate or not is another. But this type of claim is similar to false claims of blasphemy we here about in Pakistani villages, and this sometimes results in people getting killed. 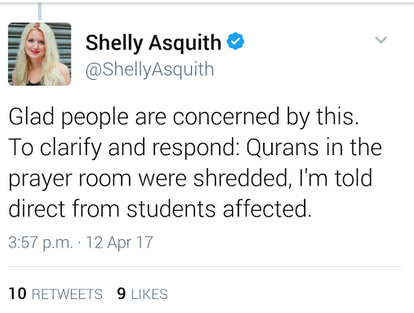 She didn’t, after a heavy night, hear someone talk about their shredded wheat breakfast while someone else nearby was talking about the koran? It’s entirely possible. I wonder if this will fizzle to zero, be a “Fireman Sam” one-day online freak-out, or a full-on “Danish”. Is she stupid? 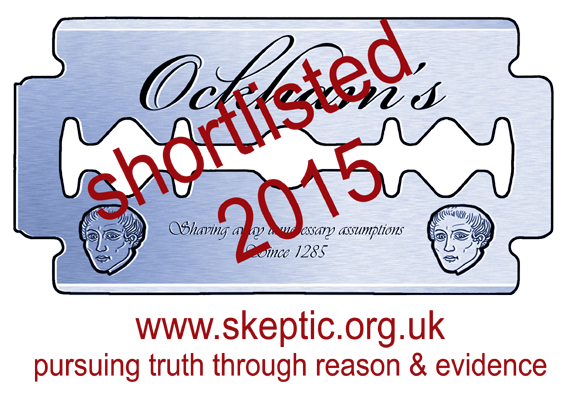 I shall answer that myself – yes, oh blimey, yes. Maybe BBC Asian can run a phone-in on what the right punishment should be. I suppose *if* students have already been saying this for a few months, we should be grateful that nothing has happened anyway, shred or no shred. But now, we have the “social media” effect. On a side note, any thoughts on this? There is a link to the full document in the first paragraph. It is school advice for Ramadan at exam time from the Association of School and College Leaders, after consultation with various types. To me, the “advice” tips over into demands, with “all” at times being affected, as well as modifying whole school activities, as well as telling teachers not to administer “tiny amounts” of water because it is “not allowed” until very obvious dehydration effects occur, as well as separating (for some reason) those not fasting, as well as a number of other concerns. There doesn’t seem to be the very simple solution of exempting exam-taking students from fasting, but rather that everything else bends in order to accommodate conservative religious practice, which is noted as an “obligation” quite a few times. There seems to be still some ambiguity here. “That is exactly what happened” said the university. 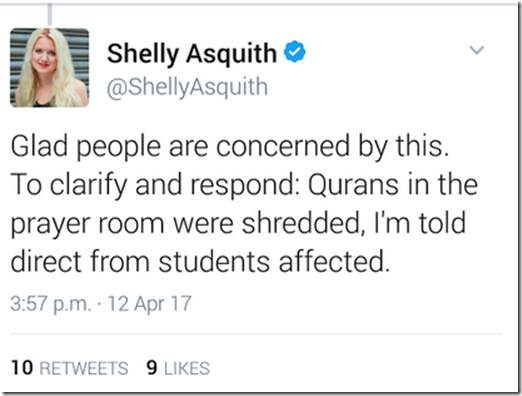 What happened – removal by the Islamic Society or “disposed of” or a bit of each? Both. Items that were not collected were disposed of. As planned. As warned. It would still seem there are too many who are unable to see that what they say fuels the problems, or understand that it is this blindness that hampering Labour as an effective opposition. I have a child at the University of Westminster. I any harm comes to them because of Shelly Asquith’s irresponsible claims, I shall hold her, along with the perpetrators, personally accountable. Even if the Quran was the most brilliant text ever written and a subset of its followers didn’t overreact to the slightest perceived slight, this woman has *still* made up an outrage story to smear a group of people she doesn’t like. It’s the M.O. of Katie Hopkins. Different target, different politics, but otherwise exactly the same. The fact that, yes, people have been killed for being accused of desecrating this book means she could’ve had blood on her hands had other people – you included – not gone out of their way to do the fact-checking she should’ve done in the first place. 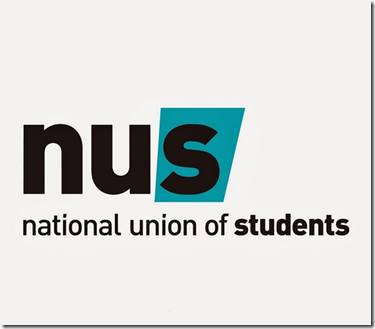 Well done to you, but it’s sad to learn the NUS is still being run by regressives like Asquith. 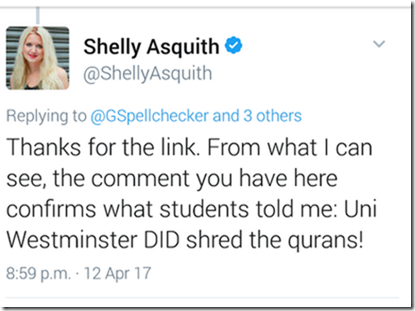 It seems Shelly Asquith has deleted her twitter account.